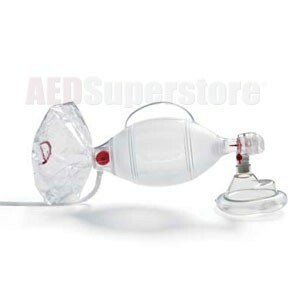 Bag Valve Mask (BVM) Guide | AED Superstore Resource Cen..
A bag valve mask plays a key role in emergency rescue breathing. They were invented to replace bulky and difficult Iron Lungs. A BVM is a portable and often compact resuscitator that enables medical rescuers to assist with patients who have difficulty breathing or who have stopped breathing in emergency medical situations like cardiac arrest. You’ve seen them on TV, in the hospital and perhaps even during a CPR training class, but where did they come from? Who uses them, and when are they used? How has technology advanced over time? What’s the difference between an Ambu Bag and a bag valve mask? Let’s get started with some essential definitions. Ambu bag. Segen’s Medical Dictionary (2012) defines an Ambu bag as, “A self-refilling bag-valve-mask unit with a 1-1.5 liter capacity, used for artificial respiration.” Segen’s Medical Dictionary (2012) also notes that Ambu bags are most effective for respiration when used on patients that have been intubated (have had a tube inserted into their airway). Medical Dictionary for the Health Professions and Nursing (2012) notes that “Ambu” is a registered trademark of Ambu, Inc., and that the term “Ambu bag” may be improperly used by some as a generic product. Mask. Farlex Partner Medical Dictionary (2012) defines “mask” as “A device designed to cover the mouth and nose for the administration of inhalation anesthetics, oxygen, or other gasses.” In the case of BVMs, the main purpose of the mask is to administer oxygen. Masks can also be used in the course of administering CPR to provide a sanitary barrier between the rescuer and the patient and ensure quality respiration. For EMTs, often BVM ventilation is the only option for airway management. For pediatric patients, BVM ventilation is often the best option for pre-hospital airway management. BVM ventilation can also be used in-hospital for elective ventilation in the operating room when there is no need for intubation. Filters. A filter may be placed between the bag and the mask either before or after the valve to prevent the contamination of the bag. Positive end-expiratory pressure. Some BVMs have positive end-expiratory pressure (PEEP) valve connectors. These special connectors allow for better maintenance of the positive airway pressure. Medication delivery. A covered port can be added to the valve assembly, which allows for inhalatory medicines to be added into the airflow. This additional component can be useful for treating severe asthma patients in respiratory arrest. Airway pressure port. A covered port can be added to the valve assembly to allow for a pressure-monitoring device to be attached. Pressure monitoring devices enable rescuers to monitor the amount of pressure being generated by the forced lung inflation. Pressure relief valves. Pressure relief valves or “pop-up valves” are often included in pediatric versions of BVMs and some adult versions. The pressure relief valve prevents the over-pressurization of the lungs. A bypass clip is also included with the valve in case there needs to be additional pressure beyond the normal cutoff of the valve. How much oxygen? The American Heart Association (AHA) recommends that BVMs should deliver breaths of approximately one second in length during CPR. How often should you squeeze? The AHA guidelines for CPR recommend that for every 30 chest compressions performed during CPR, two resuscitation breaths should be delivered when using a BVM for airway management. Before 2010, the AHA Guidelines recommended starting CPR with ventilation. Before 2005, the recommended compression-to-ventilation ratio for adults in cardiac arrest was 15:2. Chest compressions should be initiated before ventilation. A compression-to-ventilation ratio of 30:2. Each breath should be delivered over approximately one second. Passive oxygen is not recommended over positive-pressure oxygen (BVMs) during CPR. How do you use a BVM during CPR? The Basic Life Support Sequence (BLS) outlines the sequential assessments and actions necessary in situations where life support may be required. If a patient is unresponsive and has abnormal or absent breathing, the emergency dispatcher should assume that the patient is in cardiac arrest. Ideally, a pulse check is also performed at the same time the healthcare provider is checking for breathing. Pulse checks should be limited to a maximum of 10 seconds so that chest compressions will not be delayed. Chest compressions should begin as soon as possible for patients who may be suffering from cardiac arrest. Rescuers should begin with chest compressions to minimize the time taken to initiate chest compressions. Once chest compressions have been initiated, a trained medical rescuer should deliver rescue breaths. These can be delivered through either mouth-to-mouth or a bag-valve-mask device. The recommended compression-to-ventilation ratio for adults in cardiac arrest is 30:2. That is for every 30 chest compressions, the caregiver should issue 2 rescue breaths. The rescuer should deliver these breaths during pauses in the chest compressions. Each breath should be delivered over a one-second period. How do you get a proper seal? A proper seal is an important part of BVM ventilation. Factors that predict difficult BVM ventilation include patients that have facial hair, a high body mass index, a lack of teeth, or a history of snoring. Patients over 55 years of age also may have difficult BVM ventilation. The masks come in several sizes, and choosing the correct size helps with achieving a proper seal. Sizes include small, medium, and large, and the masks are made to fit on a variety of patients from newborns to adults. BVM bags also have various types of newer bags equipped with pressure valves, and some bags have one-way valves that block the entry of ambient air so that a higher level of oxygen can be ventilated. Can a BVM be used by one rescuer? In a rescue situation, two rescuers are needed to properly use a BVM. One rescuer performs chest compressions and the other uses the BVM to provide the victim with rescue breaths. If a patient is unable to breathe easily on their own but isn’t experiencing SCA and isn’t otherwise unconscious, one person may use a BVM to assist the patient’s breathing. What is Positive Pressure Ventilation? Positive pressure ventilation is when the airway pressure is applied to the patient’s airway through a tube, similar to how a CPAP (Continuous Positive Airway Pressure) device operates. Positive pressure ventilation was introduced as an easier and more effective ventilation method in the 1950s. A BVM creates positive airway pressure by forcing air into the lungs, similar to how a CPAP device operates. Before positive pressure ventilation, respiratory patients had to rely on negative pressure machines for mechanical ventilation. 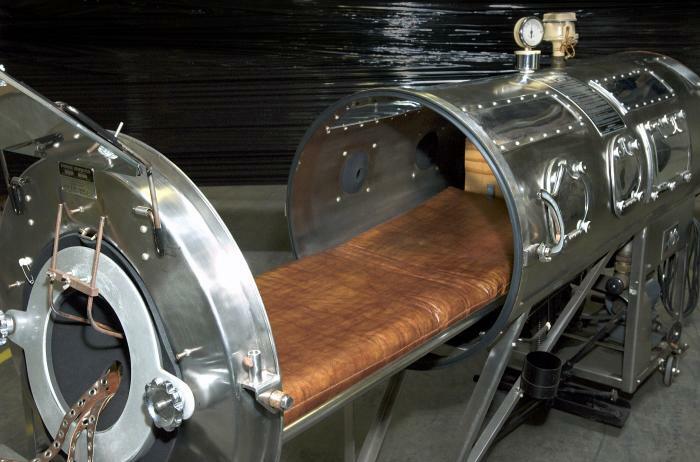 These machines are more commonly referred to as Iron Lungs. Negative pressure ventilation required a metal cylinder that covered the patient’s entire body up to their neck. A vacuum pump was then used to create a negative pressure in the cylinder’s chamber. This negative pressure caused the patient’s chest to expand. The change in pressure then caused ambient air to flow into the lungs. Once the vacuum was reversed, the chest’s elastic recoil caused the patient to exhale passively. How does Positive Pressure Ventilation work? The positive pressure applied to the patient’s airway causes the gas to flow into the lungs until the end of the ventilator breath. Once the airway pressure returns to zero, the chest’s elastic recoil causes a passive breath out. What are the risks of Positive Pressure Ventilation? The intubation of the patient (inserting a tube into the trachea) is often utilized when applying positive pressure ventilation. Intubation can lead to complications in the placement of the endotracheal tube. These complications can include trauma to the upper airway and nasal cavity; tooth avulsion; laceration of the oral-pharyngeal, the vocal cords, or the trachea; hypoxemia, perforation, and intubation of the esophagus. Additionally, long-term use of endotracheal tubes may result in tracheal necrosis or stenosis, sinusitis, pneumonia, and glottic edema. The ventilation process can also lead to complications such as lung injury. Barotrauma can occur when ventilation causes the alveoli to rupture, which then allows air into the pleural space or along the vascular bundle to the mediastinum. Volutrauma can also be caused by positive pressure ventilation. Volutrauma is the local overdistention of normal alveoli. Overdistention can cause an inflammatory reaction that may perpetuate the initial lung injury. Lowering tidal volumes and lessening pressure help to prevent these potential positive pressure ventilation risks. Oxygen toxicity is caused by the production of oxygen free radicals including: superoxide anion, hydroxyl radical, and hydrogen peroxide. Oxygen toxicity may lead to a range of complications including: mild tracheobronchitis, absorptive atelectasis, and diffuse alveolar damage. The level of FiO2 that causes oxygen toxicity is not firmly established, but the related medical literature suggests that the level of FiO2 should be 60% or less during the first 24 hours of mechanical ventilation. Ventilator-associated pneumonia (VAP) is a new infection of the lung parenchyma that occurs within two days after intubation. VAP is a serious complication with mortality rates reaching as high as 50%. VAP has an estimated risk of occurrence at 3% for the first five days after intubation. More new infections occur in trauma, burn, or neurosurgical units than in respiratory or medical intensive care units. Intrinsic positive end-expiratory pressure (PEEP) can occur in mechanical ventilation patients who suffer from COPD or asthma; because these patients require longer to exhale and may have trouble completely exhaling before the delivery of the next mechanical breath. When this occurs a part of each breath is retained within the patient’s lungs, and if this continues without correction, the airway pressure will continue to increase to the point that volutrauma, barotrauma, hypotension, patient-ventilator dyssynchrony, or even death may occur. Finally, positive pressure ventilation can also have cardiovascular effects. These effects can include: decrease preload, cardiac output, and stroke volume, as well as decreased renal blood flow, which can lead to fluid retention. Positive pressure within the chest can also lessen the blood flow returning from the head, which can increase agitation, delirium, and sleep deprivation. There are dozens of makes and models of BVMs available on the market. Various brands produce BVMs with a variety of features. Many BVMs are created to be single-use, while others are reusable after cleaning. Some are made from PVC and others are made from silicone, but most of them are latex free. Some BVMs come with special valves. 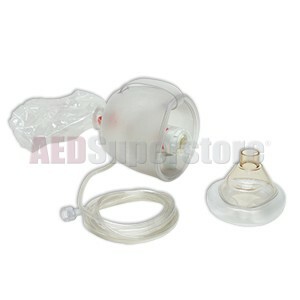 And, resuscitators are often sold with masks that range in size from neonatal to adult. Specialty BVMs have even been created for toxic atmospheres like fires and chemical spills. 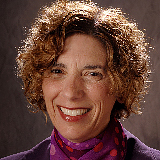 The prices of BVMs can vary greatly depending on the included features. Basic, single-use BVMs are the cheapest, starting at around $16 per resuscitator. Single-use BVMs with special valves or collapsible bags can reach close to $50 per resuscitator. 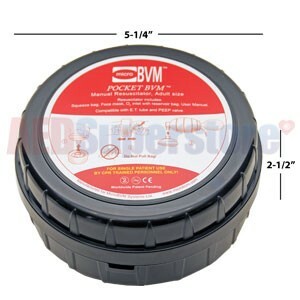 Reusable BVMs tend to be more expensive than their disposable counterparts. A basic reusable BVM will cost over $200. Specialty, reusable BVMs can cost even more with the heat-resistant, gas-filtering Ambu Military Mark III costing over $600 for one unit. The “Ambu Bag” is one of the most popular brands for BVMs. 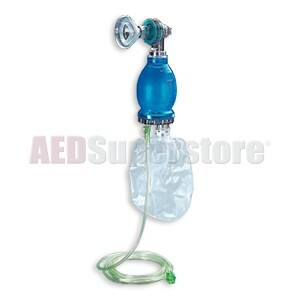 The AMBU Bag SPUR II resuscitator is designed for single patient use, so it’s disposable. It is also latex-free to avoid potential allergy problems. This resuscitator is sold with a neonate, infant, toddler, or adult mask, and an oxygen reservoir. Some models are also sold with a PEEP valve. Ambu also makes reusable models. The Ambu Mark IV Reusable Resuscitator comes with Ambu’s unique double wall bag, which improves grip, allows for quick recoil, and provides optimal volume. The Ambu Mark IV Baby also includes a pressure-limiting valve. Ambu also makes specialty BVMs designed specifically for toxic environments including fires and chemical spills. The Military Mark III has a butyl outer cover with a gas filter, and it can be exposed to high temperatures. Laerdal Medical is another manufacturer of BVMs, and their Bag II Disposable Resuscitator is similar to the AMBU Bag SPUR II. It is a single-use, latex-free resuscitator available with an infant, child, or adult mask. Laerdal also makes the Reusable Laerdal Silicone Resuscitator (LSR). As its name suggests, this model can be used more than once and is made from silicone. The silicone allows for better bag re-expansion, and it can be easily disassembled for cleaning after use. Nasco also manufactures BVMs. Nasco’s Disposable Resuscitator is available with: a non-rebreathing valve that directs exhalation away from the caregiver; a medication port; a PEEP connection; a swivel patient connection; and a collapsible bag. The disposable resuscitator is sold with masks sized for infant, pediatric, and adult. CPR Prompt is another maker of BVMs. CPR Prompt’s BVM is disposable and made from PVC. It is also transparent so that the caregiver can visually check its operation. PerSys Medical’s Pocket BVM Tactical is collapsible and compact. It is made out of medical grade silicone, and although it is single-use, it can be cleaned and reused for training purposes. The Pocket BVM Tactical is compatible with E.T. Tubes and PEEP valves. The carrying case comes in blue, orange, black, and green. Medical caregivers of the 1950s were faced with the polio epidemic in which patients’ respiratory drives were compromised to the point that many polio patients died as a result of choking on their phlegm. The respiratory issues of polio patients were further complicated by the large negative pressure ventilators or Iron Lungs that made it difficult to access the patient. Determined to help solve these medical problems, German inventor Holger Hesse took on the challenge of inventing new medical products. In 1953, Hesse began to collaborate with Danish anesthesiologist Henning Ruben, and the pair began to invent products designed to help children paralyzed by polio. Hesse’s first notable invention was the suction pump, which was originally used to clear the airways of polio patients. The BVM worked by first placing the mask over the patient’s face. Once the bag was squeezed, the air was forced into the patient’s airway. Once the bag was released, it automatically re-inflated. This simple design made it easy to use not only for anesthesiologists but for any medical caregiver. The product became available on the market in 1956, and it was met with immediate success. Hello! I’m a midwifeary student and we have this debate going on in regards to one time use bags. Why are they one time use? If you switch out the mask and cabin wipe the device what is the potential infection control issues that can arise in infant only use? Can adding a filter component make it reusable? As the manufacturer has deemed this device one-time-use, and abiding by FDA regulations, we would advise they be disposed of after use.